Deep in the heart of Ladue, preparations are taking place for a dinner that provokes much attention and anticipation. At the Hillman home, holiday dinners (or any dinner for that matter) are never taken lightly. Seasoned entertainers, both Cindy and Laurence take their roles very seriously; together they create unforgettable evenings that in some cases become legendary in their family history. Always working together, Cindy, an incredible interior designer and owner of Décor Interiors in Chesterfield, and Laurence, a published author with remarkable culinary talents, use each other as inspiration and springboards for new and fresh ideas on entertaining. Each of their strengths accentuates the other’s and the result is nothing short of spectacular. 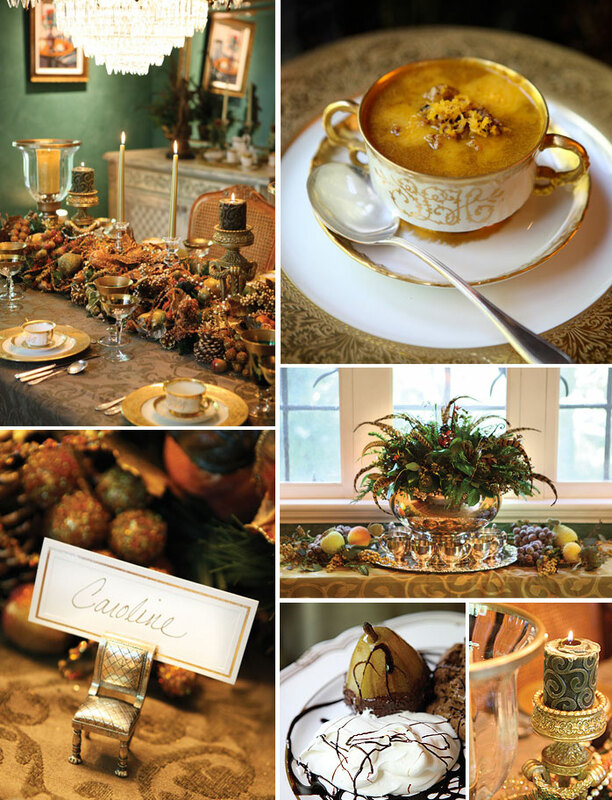 Cindy’s role is designing the tablescape, which is always a crowd pleaser — a simple centerpiece will never do. Cindy’s designs combine colors and textures in perfect balance. 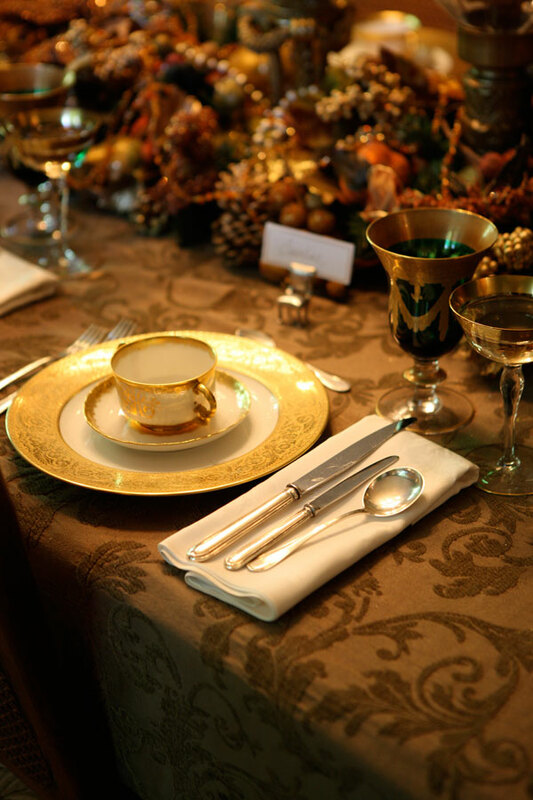 This Thanksgiving, Cindy created a tablescape that exuded elegant opulence. 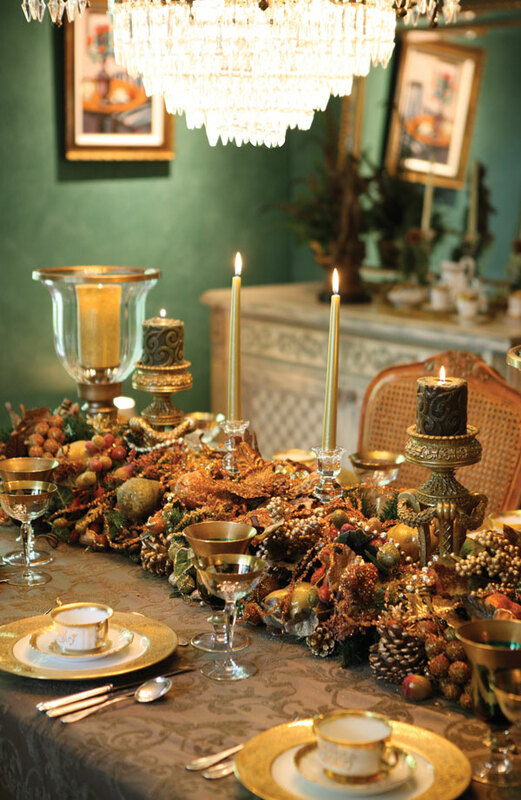 The centerpiece spanned the length of the table with a collection of pinecones, sugared fruits, fall leaves, and berries. 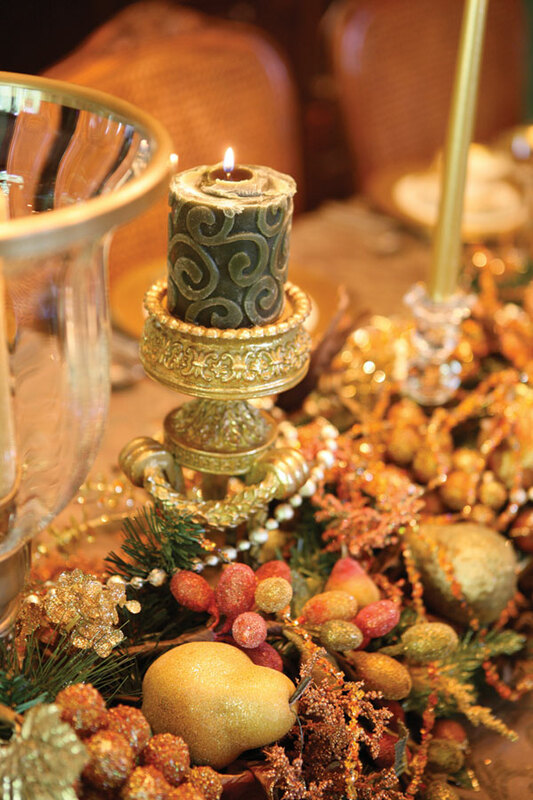 To add height, Cindy incorporated three different styles of candles: traditional tapered votives, thick, carved candles in ornate pedestals, and large candles in gilded hurricane urns. The progression of sizes and the beautiful glow from the candles pulled the design together, without ever interfering with conversation among the guests. 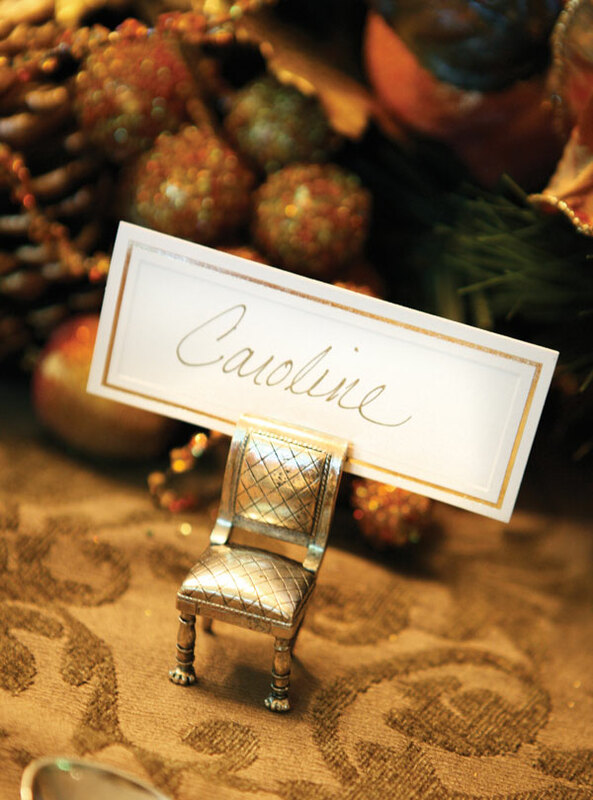 Cindy’s monogrammed gold china is a family heirloom passed down through several generations. Always one to create the unexpected surprise, Cindy uses her china pieces in unique ways. 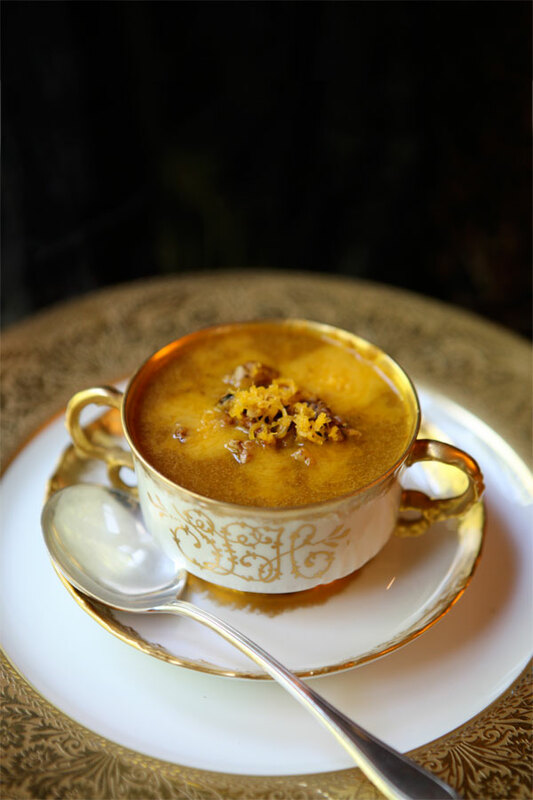 This year, for example, she served Laurence’s famous Spicy Pumpkin Soup in coffee cups — they were just the perfect size and shape for the soup. 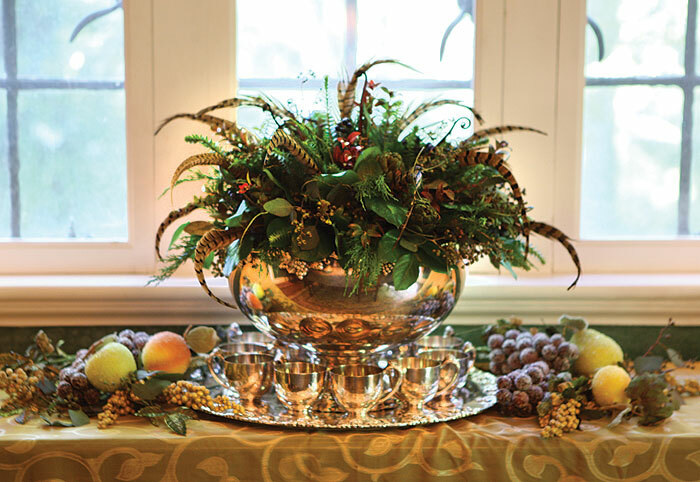 The unique presentation extended to Cindy’s incredible antique punch bowl, which was transformed into a gorgeous buffet centerpiece filled with fresh seasonal greens, peacock feathers, berries, and pinecones, surrounded by sugared fruit. As for the menu, Laurence never disappoints. 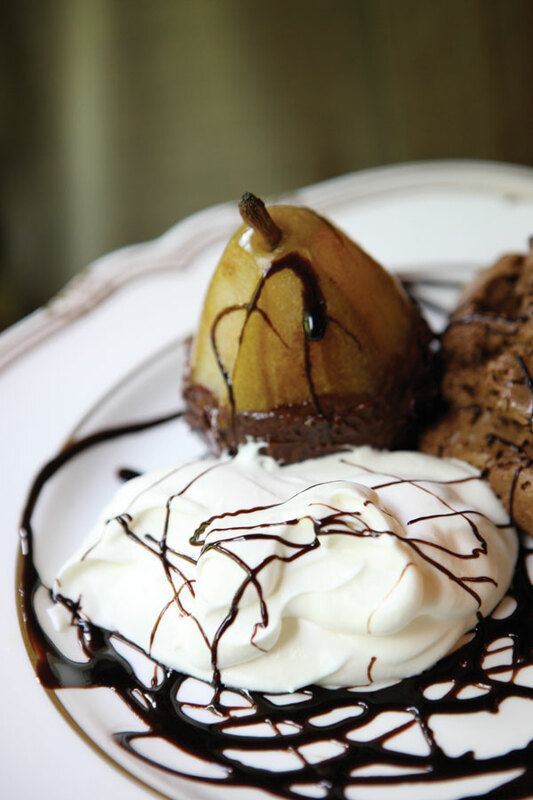 This year’s pièce de résistance, his delectable Chocolate Brushed Pears Flambé with Mousse au Chocolat, was worthy of a standing ovation and maybe even an encore!